Any way there available for us to work well with raw MXF with multi-track for FCP, Sony Vegas or Windows Movie Maker? With the advanced and stable high quality of MXF footage, it has been widely used by these popular camera brands, such as the Canon XF series, Sony PMW series or Panasonic AG series, etc. From above, we could find out the popularity of MXF files. However, do you know as the container format, MXF has not been directly accepted by these hot programs such FCP, iMovie, Movie Maker or even Sony Vegas etc. As usual, we are going to find some third-party tools which can help us get rid of such troubles. 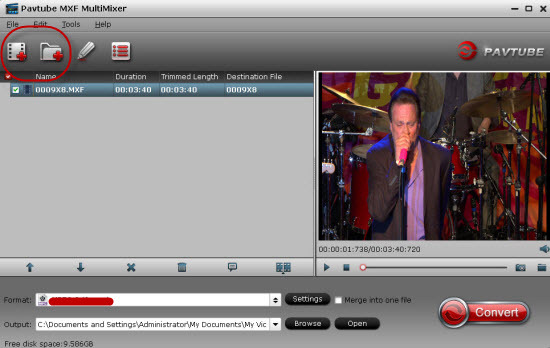 Searched online, you may find the Pavtube MXF Converter for Mac/Windows can handle this job well which also has the good reputation there that we can trust well. Tips: Is there any review of this MXF Converter we can know more details? Q: What if I wanna edit my raw MXF files in Sony Vegas with multiple audio tracks? Step 1.When you download and install the MXF converter, ‘Add video’ is a nice way to load your original video clips in, only for Sony Vegas Pro, they will be listed on the blank place. Additional, batch conversion is supported well. Step 2. 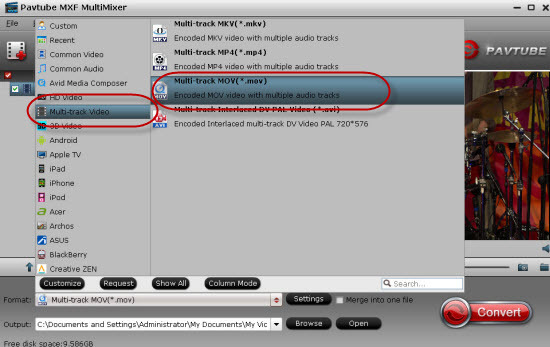 Choose the right output to make the MXF files with multi-track audios preserved. Tap the ‘Format’ bar and select the ‘Multi-track Video’ to find the best one: ’Multi-track MOV(*.mov), which can be accepted by Sony Vegas well. Additionally for those advanced users, if you do not need all audio tracks for output, click “Settings” button you are allowed to uncheck the audio tracks you do not want for output. And you can choose to keep default settings or adjust parameters, like codec, bitrate, channels, etc, according to your different requirements. If you are a professional videographer, you must always work with the MXF recordings, so here are some related MXF guides written on this MXF Subject Page, I hope some of them could get rid of your troubles. Finally, go back to the main interface, do not forget to tap the ‘Convert’ button to get your work started. Audio Issues When Editing Sony PMW 150 MXF in FCP? How can we convert Canon MXF to FCP 6/7 with multiple audio tracks preserved? How to Compress/Convert 4K Video for Editing with Windows Movie Maker? I have been using the Pavtube MXF MultiMixer since its version 4.8.5.0. It is very fast and multi files can be converted at the same time. The video trim function become more powerful than before and I like the multitrack output very much. The output file size is not very big but with a quite good video quality. To conclude, it is a simple but very powerful video converting software. A great solution to a real pain! Had MXF video from Sony XACAM camera. Needed to convert MXF from PC to editing in Sony Vegas. Looked on heaps of forums and software as per chats,plus tried other free software – all a hassle with either no result that worked or poor quality output. Pavtube product is great and works quick on batches and multi-track output. Great value for money – well done and thanks. This software work well with MXF videos! drag it to this program and choose multi-track mov as output—Now I am edit it on Sony Vegas, and just enjoy it!